The Columbian: Shame on America? Shame on YOU. Shame on America? Shame on YOU. 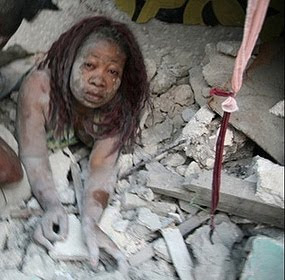 On Jan. 12, 2010, a 7.1-magnitude earthquake struck the country of Haiti. According to the BBC, the quake has killed at least 200,000 people and has left 1.5 million people homeless. Haiti is the first independent black nation and a third-world country that was already struggling with poverty and illness. This country has a rich history and beautiful land that many Americans enjoy as a vacation hot spot. The U.S. and Haiti have been connected for almost 200 years, according to the History Commons Web site, and the U.S. helped protect Haiti from Germany and France in their attempt to take over Haiti in 1915. Despite the long relationship between the U.S. and Haiti, some Americans are showing ignorance and disrespect in helping Haitians in their time of need. A recent status circulating on Facebook is disturbing: "Shame on you America: the only country where we have homeless without shelter, children going to bed without eating, elderly going without needed meds, and mentally ill without treatment - yet we have a benefit for the people of Haiti on 12 TV stations. 99% of people won't have the guts to copy and repost this ..."
Now, this statement is 99 percent false. First, let me remind you that although the U.S. is in an economic crisis, it is one of the wealthiest countries in the world. America certainly has homeless without shelter, but it is most certainly not the only country. Haiti had many homeless both before and after its devastating national disaster. Does America have children going to bed without dinner? Yes, but again there are many other countries in which more children are dying because of no food or water. Yes, the health care in the U.S. may not be the best, but compare the quality of health care here to that of countries that have an average life expectancy of only 50 years. No matter how bad things might seem here, right now Haiti has it much worse. Their homes, towns and everything they have are gone. America has a long history of helping other countries, and holding telethons to support those here and abroad in times of disaster is nothing new. It is nearly an American custom to hold telethons for national disasters, and some of them include 9/11, Hurricane Katrina, as well as the tsunami that hit South Asia. To those who would shame America for helping Haiti, consider what President Barack Obama said in his State of the Union address on Jan. 27, 2010: “As we have for over 60 years, America takes these actions because our destiny is connected to those beyond our shores. But we also do it because it is right.” Let’s do what’s right, and support our fellow human beings in their time of need.